On a map, Ireland’s northwestern corner appears as if a giant stepped on it, splaying the land into fingers webbed by a raggedy-edged coastline. Wind-scoured headlands cradle swaths of sand, forested valleys shelter shimmery ponds, and heath-clad mountains overlord barren peat bogs. It’s expansive yet intimate, tame yet wild. 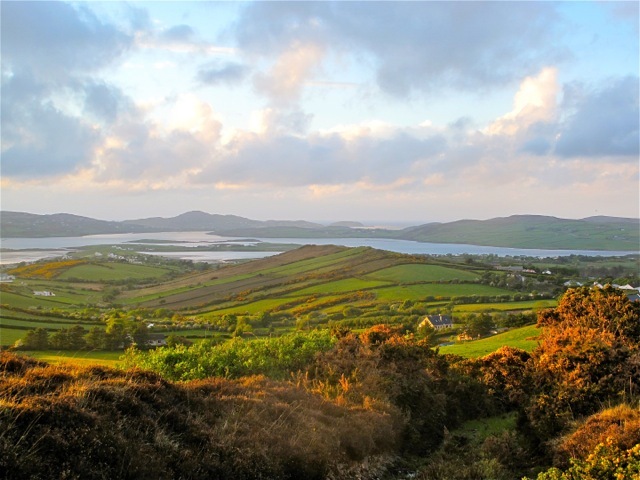 In spring, like much of the Emerald Isle, it’s painted with brilliant greens and heather hues and splashed with sunshine-yellow gorse blossoms. 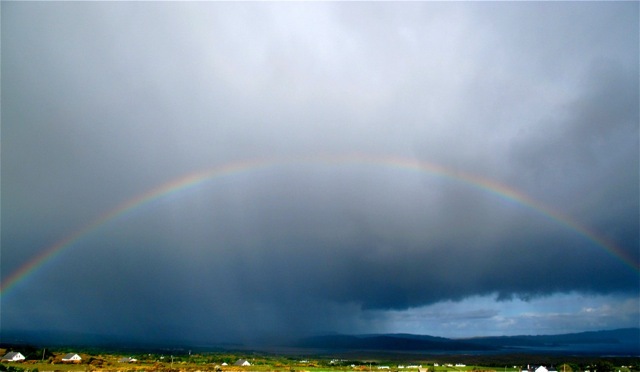 In a country where soft rain, clear air, and golden sunlight ensure rainbows, County Donegal is the pot of gold. 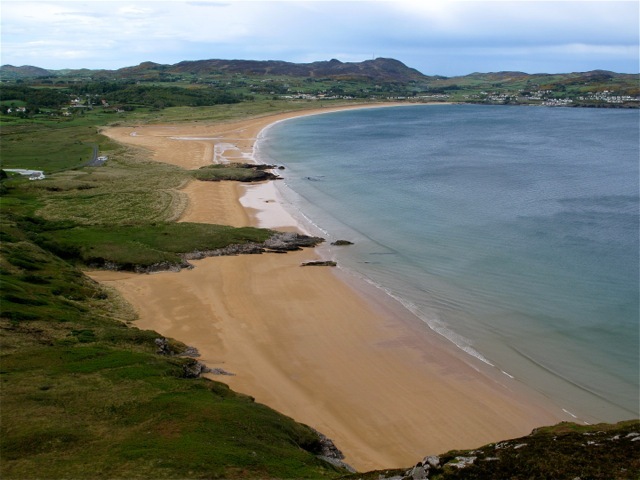 During 10 days poking around northern Donegal’s nooks and crannies, I fell completely under its spell. We started on the Inishowen Peninsula. The word Inishowen whispers on the tongue but has bite. Each time I said it, it sunk its teeth more deeply into my psyche. So too did the peninsula, bound by Lough Foyle, Lough Swilly, and the North Atlantic. 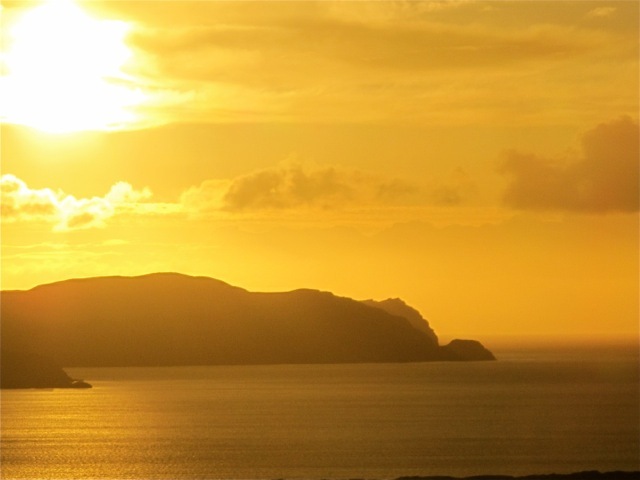 We had only one afternoon and the following morning to explore, so we set our sights on Ireland’s most northerly point—Bamba’s Crown on Malin Head—and booked an overnight at the nearby Inishtrahull View B&B. After devouring too many of the B&B’s welcoming fresh-from-the-oven scones, I walked down to the sea. Cliffs and rocky beach flanked a strip of grass marred by a hint of walls; all that remained from a 16th-century church. 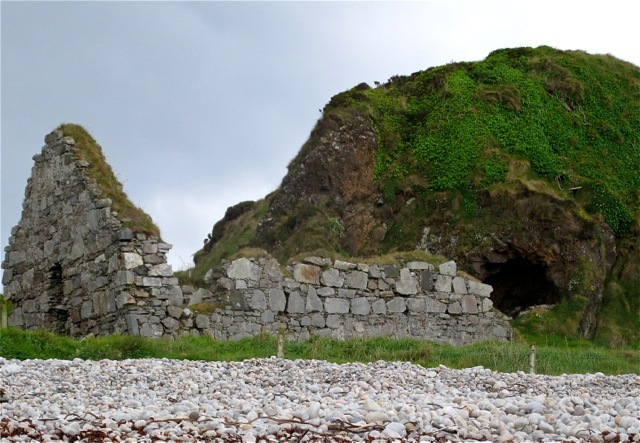 When a passing storm let loose a driving rain, I huddled in their meager shelter until, spying a cave in the cliff, I slipped into the Wee House of Malin, another bedraggled soul among generations of pilgrims and visitors seeking refuge in this allegedly former home of St. Muirdealach. I had it to myself, but according to local legend, no matter how many people enter, there’s always room for one more. I gave thanks, made a wish, and like others before me, tucked a coin into a crag. 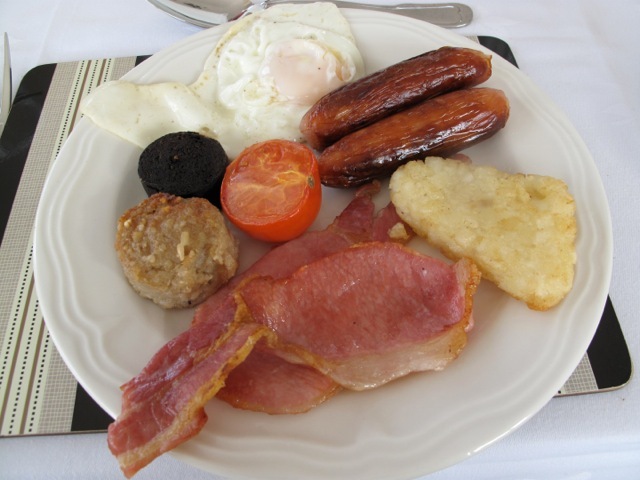 The next morning, fortified by a traditional Irish heart-attack-on-a-plate breakfast, we dipsy-doodled down Inishowen’s western flank, following the sign-posted Inishowen 100 scenic drive. We stopped to ogle massive sand dunes at Five Fingers Beach, zigzagged through the Mamore Gap mountain pass, and explored Grianan of Aileach, a ring fort founded by the Druids roughly 4,000 years ago that caps a hillside affording head-swiveling, 360-degree views. We could have spent a week exploring this peninsula, but our rental house in Carrigart awaited. 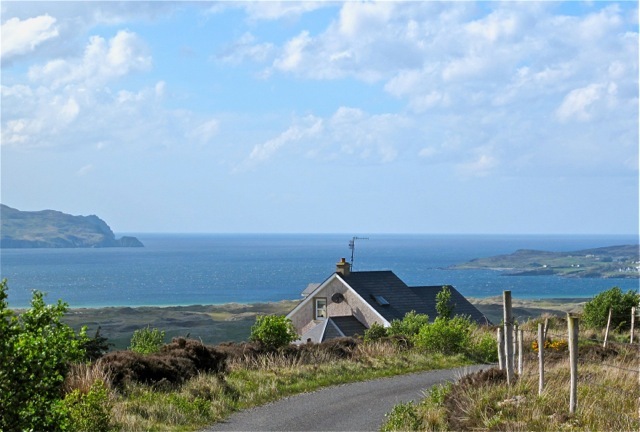 Built high on a hill, our temporary home (right) provided expansive—and spectacular sunset—views taking in the seascape from Sheephaven Bay, framed by Horn Head and the Rossguill Peninsula, to Mulroy Bay, shaped by the Fanad Peninsula. The location was perfect for touring these peninsulas, each rimmed with cliffs, dotted with whitewashed villages, and peppered with sand beaches. It also made a good base for trips to northwest Donegal. On nights I didn’t prepare dinner with finds from a local farmers’ market, we frequented local pubs to savor fish and chips washed down with pints of Smitty’s or Guinness and paired with good craic, the Irish term for fun, ranging from good conversation to live music. From previous Ireland sojourns, I knew that the detailed Ordnance Survey Discovery Series Maps were indispensible for exploring. We purchased Map 2, using it to plan daily adventures in our viewshed, and Map 1, for exploring farther west. I expected to hear Irish, as much of this region is in the Donegal Gaeltacht, an Irish speaking area, and I did. I also expected jaw-dropping vistas, and I wasn’t disappointed. But it was the unexpected finds that made each peninsula loop and day trip memorable. The seven-mile Atlantic Drive circles the Rossguill Peninsula, and we drove it at least three times, veering down different byways each time. Despite the frequency, I never stopped holding my breath on the cliff-hugging hairpin turns nor tired of viewing Tramor’s and Trabeg’s linked arc of golden sands, browsing McNutt’s Woolen Mill in Downings, or strolling Rosses Strand. One doesn’t drive the sprawling Fanad Peninsula as much as mosey. Rural roads snake through rolling farmlands and heathlands, nose out to beaches, and dead end at cliffs. 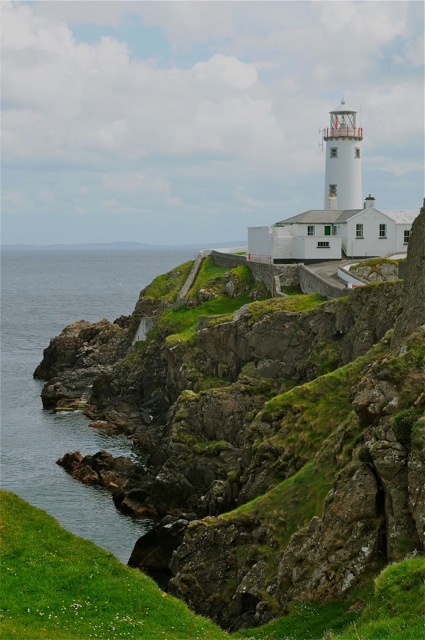 We looped, sidetracked, and backtracked en route to Fanad Head Lighthouse (right), dramatically sited on a rocky outcropping on the northeast tip, then shimmied down the peninsula’s eastern side. A sign for the Donegal Garden Trail tempted touring the spring bounty at Carrablagh House, instead we walked the sands of one of the world’s most beautiful beaches, Ballystocker (above). Then we zigged west to Mulroy Bay and poked around castle ruins in Muross, stopped for memorable soups and salads at Curlew Café & Crafts in Kerrykeel, then zagged east to Rathmullan, on the Lough Swilly Coast, where I prowled around the ivy-covered seaside ruins of a Carmelite Friary dating from 1516. From our house, cliff-edged Horn Head’s distinctive silhouette (left), rising roughly 600 feet from Sheephaven Bay’s waters, beckoned. En route, we detoured to Doe Castle and Ards Forest Park, then explored the market town of Dunfanaghy. 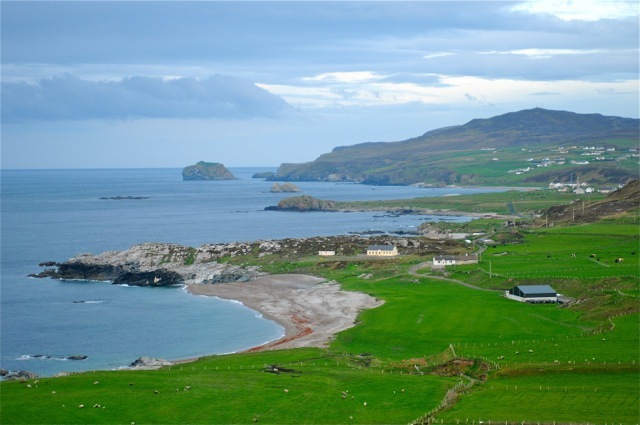 We expanded our explorations to northwestern Donegal. One day we shadowed the coastline, which is salted with ledges and islands and scalloped with harbors and bays. 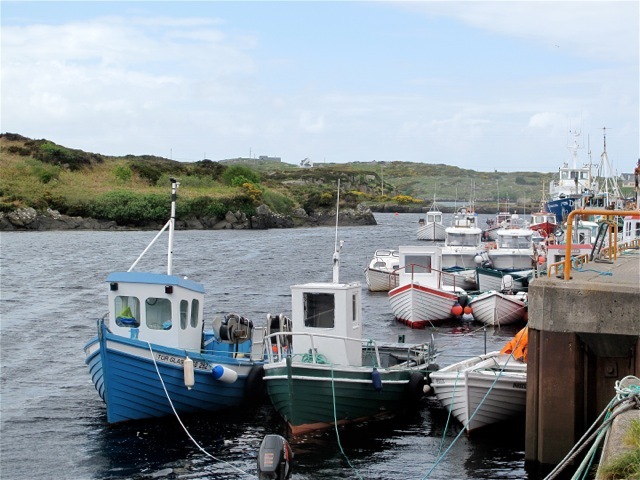 We ebbed and flowed around The Rosses, from Dungloe to Annagarry, stopping to poke around pocket-sized fishing villages and stroll sand beaches. 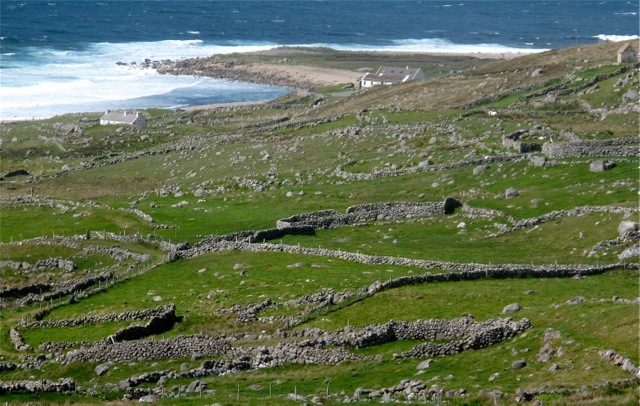 We pressed northward through adjacent Gweedore, Ireland’s most northwestern parish, passing through villages with irresistible hobbit-like names such as Bunbeg and Derrybeg. We debated whether to ferry out to Tory Island, once home to Balor, the Celtic King of Darkness and where human history has been traced back 5,000 years, and paused to view a shipwreck on the sands of Magherclogher Beach. The further north we drove, the more wild the seascape and rugged the landscape became. A crazy quilt of sheep-dotted, stonewall-stitched fields blanketed the countryside, yielding to an unforgiving coast (right). While it’s easy to imagine Bloody Foreland headland as the site of long ago battles or violent shipwrecks, the name comes from the sunset glow of its red granite cliffs. 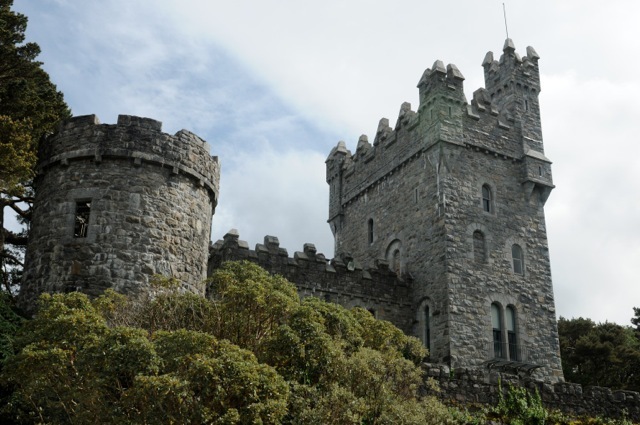 Our last gadabout routed us through the woods and waterways and bogs and barrens of the Derryveagh Mountains and our grand finale, Glenveagh National Park. The prize, of this trail-laced 39,000-acre park, is the former Glenveagh Estate. It’s home to the visitor center with information on the park’s history, red deer, and golden eagles, and a spectacular, lakeside 19th-century castellated mansion and gardens. The original owner earned infamy for evicting tenant farmers during the famine; the last was curator of Decorative arts at the Philadelphia Museum of Art. The mansion (left), open for guided tours, is a treasure. Rivaling it are the surrounding Victorian gardens and pleasure gardens, which include the Gothic Orangery, Italian Terrace, and Tuscan Garden. I wandered in a misty rain, which illuminated brilliant rhododendron blossoms, then hiked the View Point Trail. The air cleared, the sun smiled, and as I looked down over the glacier-carved valley—castle and gardens, lake and glen—a rainbow kissed the sky. Tags: Donegal. Bookmark the permalink.